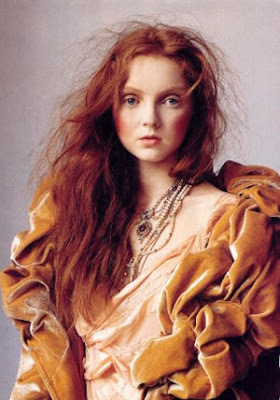 and popular British model, Lily Cole. Lily is just 18, but her appearance, at least in repose, is strangely ageless. The otherworldly doll face, [seemingly] unfathomable gaze and fiery hair have in the past reminded me of Elizabeth I, but Carpaccio's knight looks like her 15th century twin. Lily will soon make appearances in Marilyn Manson's Phantasmagoria (below, as Alice), and in St. Trinians. Posted by la femme at 9:01 p.m.
Go to http://www.wga.hu/frames-e.html?/html/c/carpacci/index.html and see the detail of Presentation of Jesus in the Temple. Also agreeably agnate, in fact, perhaps the same model. So has the same look been alluring for centuries? i just went to his site and that thing is freakin crazy!! yea i heard about his movie last year and i really wanted to see it. thanks for the update on this apparently insane film! omg the similarity is freaky. You should have seen me in my history class when I first saw this painting. 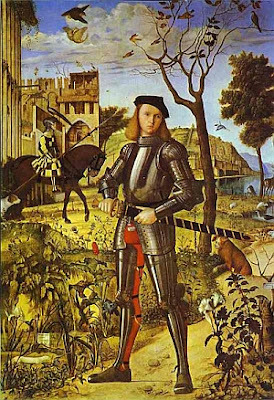 My teacher was doing a lecture on the differences between late medieval and renaissance art and told us to open our textbooks to see some examples, and all I saw on the page was Lily Cole. I started freaking out and asking to see other people's textbooks just to make sure someone hadn't cut and pasted her face into my book. randomly the first thing I thought of was the similar shapes of Ghesquiere's desgins for Balenciaga! weird! Cole always reminds me of Maggie Rizer, but they both have that medieval thing going on.